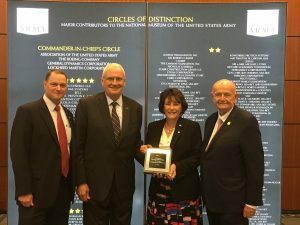 October 2018, Washington DC: Jan Smith, CEO for S3, was presented a recognition plaque for her generous contribution to the Army National Museum. The plaque is made from stainless steel and granite stone used in the construction of the museum. The background is a mini replica of the donor wall that will be prominently displayed in the museum when it is completed. Shown in the photo is Bob Johnson, SVP for S3; LTG (R) Roger Schultz, President Army Historical Foundation; Jan Smith, CEO & President of S3; and GEN (R) Gordon Sullivan Chairman of the Board of Directors Army Historical Foundation. Upon its completion, the National Museum of the United States Army will stand as the crowning achievement of a historical preservation effort. The National Museum of the United States Army will celebrate over 240 years of Army history and honor our Soldiers-past, present, and future.